Found in a variety of habitats including acidic and alkaline lakes and silt and detritus ponds, usually among emergent vegetation. It is less common in flowing water than the very similar Sigara falleni. S. distincta overwinters as an adult and has a spring and a summer generation. It tends to match the tone of background on which it develops, being darker on dark backgrounds and vice-versa. The map is based on records from NBN Gateway, with yellow dots showing pre 1990 records, reds dots 1990 – 2015 records and red on yellow dots overlapping records. 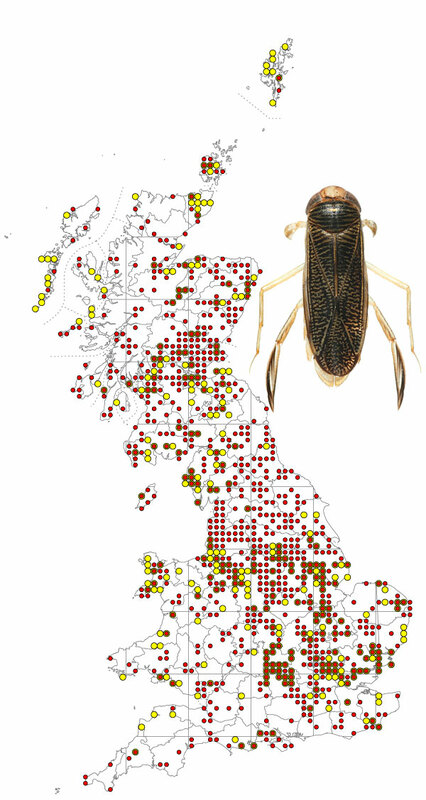 A widespread species in the UK, also found throughout Ireland.